Corn on the cob can be horribly, horribly bland; it also has the potential to be extremely delicious. Normally more of a summer barbeque dish, it has become something of a regular fixture for weekday mealtimes in this house. Grilling the corn as opposed to boiling it really brings out the sweetness, and seasoning it with salt and pepper before putting it under the grill works a treat as the flavours infuse as it cooks. A little drizzle of oil helps the seasoning stick, and removes the need for butter at the end. Delicious! Remove the outer husks from the ears of corn to reveal the sweetcorn cob underneath. Wash thoroughly and remove any fine hairs still attached. Turn the grill onto a high heat, and on a heatproof tray, drizzle the cobs with olive oil - enough to coat each cob - and season with salt and pepper. Place the cobs under the grill for 10-15 minutes, turning regularly - you don't want the corn to catch. When cooked, the kernels should be soft, with the odd caramelised one, as seen in the photo above. 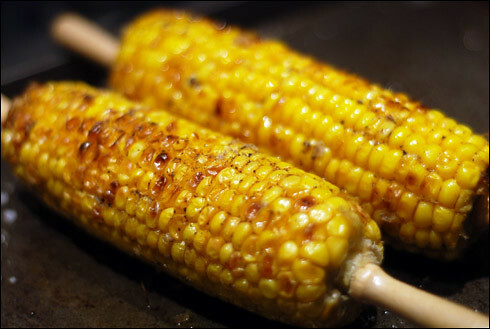 Remove from the grill, skewer with corn on the cob holders and enjoy one of life's simple pleasures. Mm, there's something so gorgeous about its simplicity. Love your blog! thanks bee! i know, i find so often that the simplest things are the best.